Five ringers: Anne, Barbara, Judy, Ken, Thomas. We were all happy that the air conditioning is working again. The session focused on rounds for Anne and Barbara, who both rang so well that we branched out into more challenging work, including the first Call Changes for Anne and Barbara. We raised 1234 then 56 when the fifth ringer arrived unexpectedly. Full Pull of Rounds then stand. Three Strokes of Rounds then stand, starting at hand and at back. One Stroke of Rounds then stand, starting at hand and at back. Rounds on Five with first Barbara then Anne leading. Anne leads mostly by ear and will work to develop her leading-by-eye to help when things go poorly; Barbara leads mostly by eye and will work to develop her leading-by-ear to help strike more accurately when things go well. Some of the ringers broached the possibility of ringing for the Fourth of July. Five ringers: Anne, Barbara, Eoin, Marguerite, Thomas. We rejoice to have Anne back with us after a lengthy absence. Anne, Barbara, and Eoin raised 23456. Rounds on Five, rotating ringers to the right and permuting every so often. Some very well-struck rounds were rung occasionally as everyone worked on ringing steadily, controlling their bell, and adapting to the changing conditions around them. Four ringers: Judy, Ken, Marguerite, Thomas. Marguerite and Thomas raised 23456, in expectation of a fifth ringer. We rang Plain Hunt on Four. A ringer commented that we often practice something for a few minutes, then move on to something else before all the ringers have really understood and internalized what we were doing. The band was inspired to counter this by ringing Plain Hunt for the entire hour. We rotated one bell over three times so everyone rang in every place. Before each rotation we rang Whole Pull then Stand to mark the change, until all bells stood together. The last time we all stood together on the first attempt. We finished up by ringing down in peal. Partway down we shifted from 1234 to 1324, then kept in that sequence to the bottom, so it sounded mellifluous even if not in rounds. A rain awning now hangs above the bells. Tonight’s storm will give it its first test. After several rounds of taking measurements and trying the awning’s rope harness for size, the dimensions seemed reliable enough to construct the awning. The parish hall was reserved for the day to give space to lay out everything. 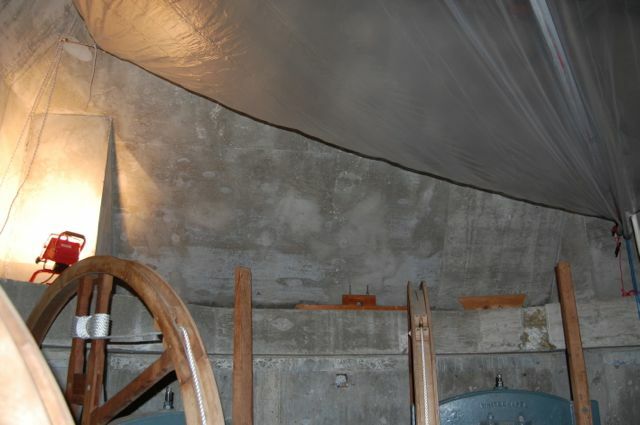 The rope harness was taped to the floor first, in the configuration it was expected to have when lofted in the bell chamber. 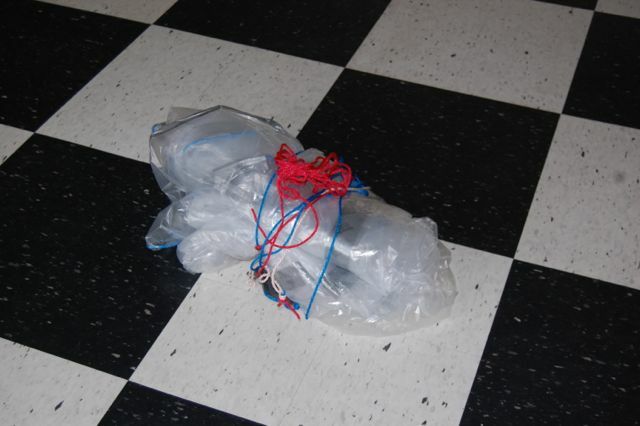 Next the 1mil plastic sheet was run under the ropes, cut to size, and taped to the ropes with duct tape. 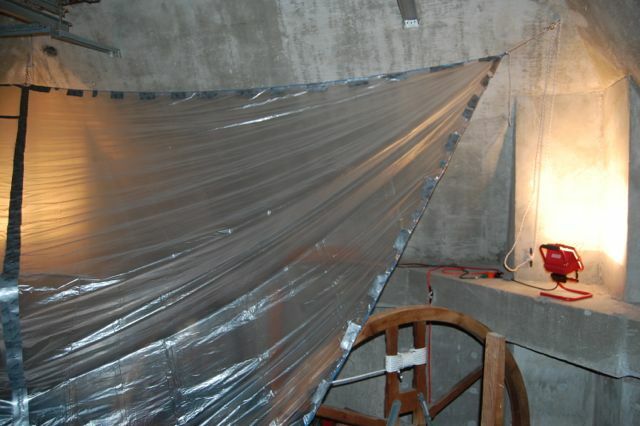 The awning was bundled into a surprisingly small lump and carried up to the bell chamber, where it was lofted into place without incident. 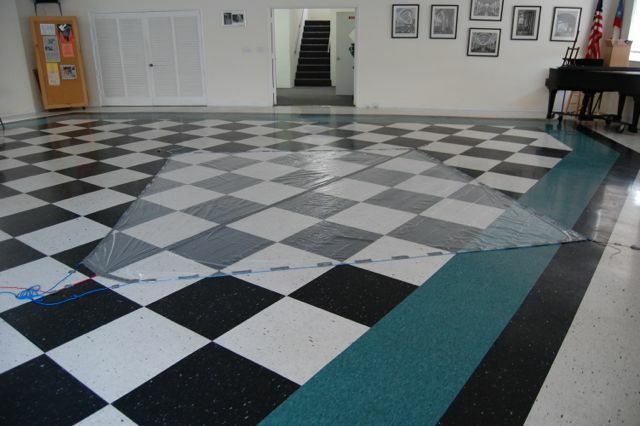 heavier plastic sheeting should be used; 1mil is so thin it is difficult to avoid damaging the awning. Also, the complicated V-corner at the low corner did not turn out well and could be replaced by a simple pointed corner. Finally, the diagonal dimension did not turn out well; the SE corner had to be given about 5″ more out from the wall in order for the awning to hang without any low spots that would collect water. Six ringers: Barbara, Eoin, Jim, Judy, Marguerite, Thomas. The air conditioning was out again. Fortunately it was a pleasant cool morning and we opened all the windows, but even so we were hot by the end of the ringing. Barbara and Eoin raised 1 through 6. Rounds on 4, then 5, then 6 as ringers arrived. Plain Hunt on 4 with tenor behind. Potential learner Melanie visited again; we hope she will be able to learn to ring and then ring with us. For the Miami ringers, used to our tower dating from 1984, it is intriguing to contrast our week-to-week experience with that of ringing on the six at St Mary’s Addersley in the UK, whose oldest bell is thought to date from 1390. Six ringers: Andrew, Jody, Judy, Ken, Marguerite, Thomas. Nancy stayed over from Early Practice for a few minutes of rounds. Most of the band adjoined to a nearby pub afterwards.